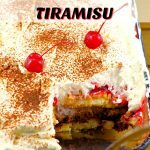 I love tiramisu and black forest anything so I created this easy no bake dessert. 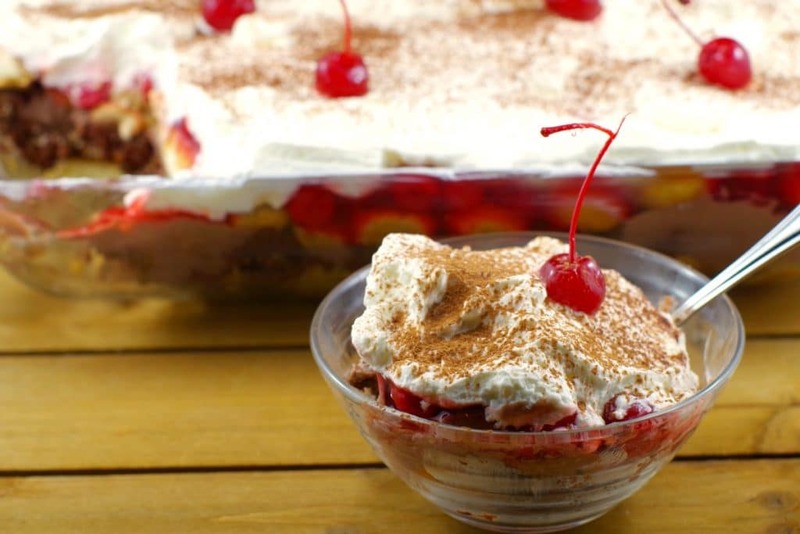 Quick and delicious, it is a combination of tiramisu and my family’s favorite black forest trifle. So, it was perfectly fitting for my VERY FIRST blog post when I started Food Meanderings 2 years ago. Because it was my first post and I’m celebrating my 2nd year Blogiversary I have decided to fix up this delicious and gorgeous tiramisu trifle and republish it! Fortunately, the 2nd year of blogging is easier than the first. I’m not saying it’s easy because it most definitely is not, but the learning curve isn’t quite as steep. You can read about my first year of blogging and what I’d wish I’d known before I started a food blog here: 10 things I wish I had known BEFORE I started a food blog. I think it’s like anything new (i.e. a new job), in the second year you get into a better groove, it’s less overwhelming and you can move past survival and into the realm of creating better quality. Don’t get me wrong, it’s still a constant learning process and A LOT of work, but once you’ve established a routine, you are a little more efficient and know how to use your time more effectively. And most importantly, it’s still fun. I have especially enjoyed re-shooting several of my first recipes. It’s satisfying to see how much I can improve them and how far my photography has come. YIKES! It definitely wasn’t as appetizing as it could have been, but I didn’t realize how important photos were at the time. And as we all know, people eat with their eyes first. So, feast your eyes on my new photos! This dessert now looks almost as good as it tastes. No Bake Desserts are the best! This chocolate tiramisu with lady fingers and chocolate pudding makes a great last-minute dessert for summer BBQ’s or a potlucks, especially on those hot days or when you want the taste of homemade in an easy tiramisu dessert without actually having to turn on the oven. I have brought this black forest no bake dessert to several potlucks and bbq’s and it’s always a hit! Who doesn’t love whipped cream, chocolate, kahlua, cherries, lady fingers and chocolate pudding?! This recipe uses store-bought cake, instant pudding (snack packs) and canned cherries for quick and easy prep. But by the taste, you’d never know how fast it is to prepare! So, if you are looking for black forest recipes, you’ll love this one! AND….if you love tiramisu, then give my other tiramisu recipes a try! When I first started this blog, I actually worried that I may run out of recipes/recipe ideas. I guess it’s a legitimate concern. However, I have noticed that I consistently have up to 100 recipes and ideas in my drafts. So, I don’t think that’s going to be a problem. I also worried that I’d get tired of it. But that hasn’t happened either. In fact, my passion for it has not wavered and I’m still having FUN! So, until I’m no longer having fun, I’ll keep plugging away…. 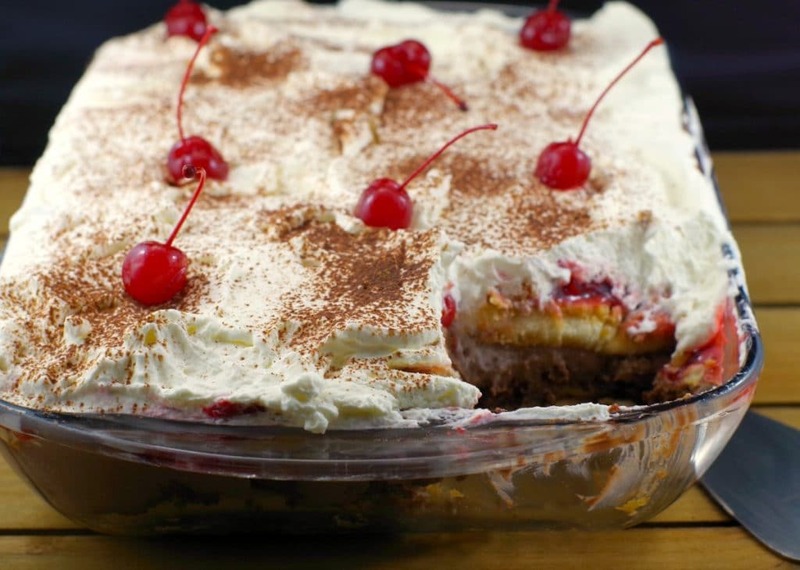 This black forest tiramisu is a combination of my family's favourite black forest trifle and tiramisu. It is a scrumptious and easy tiramisu dessert with no baking for potlucks or BBQ's. Mix cooled brewed coffee and Kahlua together. Break up cake and place evenly over soaked lady fingers. In a separate bowl, mix pudding with mascarpone cheese. Spread pudding mascarpone mixture over cake. Pour remaining coffee Kahlua mixture into shallow bowl. Dip each lady finger and turn once. Place soaked lady fingers over pudding mixture. Spread cherries evenly over lady fingers. Top with whipped cream and spread evenly. Garnish: sprinkle cocoa over whipped cream. Top with maraschino cherries, if desired. Previous Post: « Fried Caesar Chicken: The Ultimate Picnic Chicken! This looks delicious but what I like best is that your recipe makes me feel as though I could actually do it! 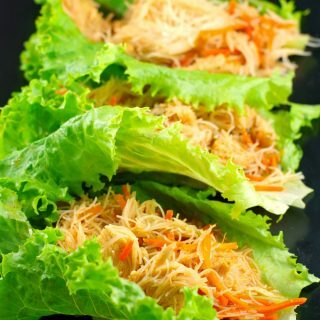 Tried this recipe and the whole family loved it! So glad to hear that, Sue! What an incredible idea, this is two of my all-time favourite things combined! My father would absolutely love it, too, I will be filing it away for his next visit! Hi Cheryl: Thanks! I hope you and your Dad enjoy it! Hey Terri! My blog turned FIVE last month and I am still learning new things. Also I have been slowly updating my cringe worthy old photos. It’s funny how proud I was of them back in the day! This dessert looks fabulous. Black forest was my fave as a kid. My mom would customise it for me and instead of cherries I would have strawberries. I might try this with fresh summer berries! Thanks re: dessert. I think strawberries (or any berries) would be wonderful with this!